Jean began working with sculpture in 1989, when she relocated to Santa Fe, New Mexico. It was her husband, Don, provided encouragement to explore and do what she could to learn about the creation of three dimensional art. She discovered the Scottsdale Art School, which offered courses with exemplary sculptors and she signed up for two months of courses. Quickly she understood the principles of constructing armatures, applying clay, casting methods, moldmaking, patinas, and working in water-based clay. She forged liaisons with professional sculptors. She then spent two months mentoring with a master sculptor in Loveland, Colorado, one of the instructors she felt offered the greatest depth of understanding what contributed to great form. 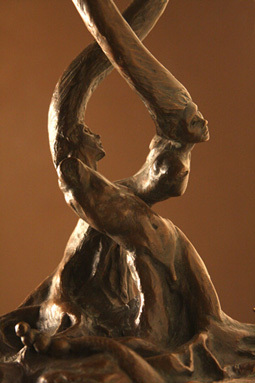 Twice she exhibited at the Loveland Sculpture Show and for several years, participated in the Santa Fe Sculpture Guild. Through the nineties, Jean cast a number of bronzes, primarily equestrian, and exhibited them on both east and west coasts. But, her love was working with the form of both human and horse in action. Her non-equestrian pieces depict her interest in mythology (see Enkidu and the Courtesan) and a contemporary commentary interpretation on pre-Columbian art (see Human Sacrifice). Jean entered a competition for the 300th anniversary of the Salem Witch Trials, a commemorative competition for a monument in a park in central Salem, Massachusetts. She contributed two completely different entries, a contemporary structure called the Twisted Cross, suggesting a fundamental shift that occurred within the events of the witch hunt within the legal system of that time. The other was a more signature piece for Jean, called “Witchtrials”, a dramatic piece featuring an agonized female bound by wrist chains, her cape blowing upward morphing into the forms of the characters who played roles in the nineteen accused witches who were torched based upon the spectral knowledge of witnesses. The latest of Jean’s sculpture is Axis Mundi and the Caldera Bowl, completed in 2011. A commission offered to her by a close friend is perhaps her finest work so far. Jean feels it closely expresses the full range of her life’s effort to incorporate and bridge multi-dimensional realms of existence with suggestive symbols of relevance to her.